Happy One Year Anniversary, MyTurnQuips.com! For this post, I thought it might be worthwhile to identify and discuss some of the setting choices that I have gravitated to within Google Blogger. These are choices that were not entirely apparent to me when I first established my blog. This post may be of interest to folks who are considering a blog or who are using Blogger and are looking to find ways to improve their blog. While these pointers are targeted to Google Blogger, the concepts may also apply to other blogging hosts such as Word Press. I have noted in (parentheses) the tab on the left vertical Blogger Administration menu the corresponds to the topic discussed. 1. (Template) Choosing a site template: My philosophy here is that simpler is better. I strongly recommend sticking with the "Simple" grouping and picking standard colors such as black or blue and shades thereof. "Dynamic" templates sound great, but there have been many times where I have visited "dynamic" type blogs and either encountered instances where the dynamic view did not work quite right for the particular device I was using (such as iPad) or instances where I have been very annoyed with social media bars moving to attempt to coincide with what I was really trying to look at. Simple choices generally make your layout understandable to users and picking standard colors helps to ensure good visual contrast and readability. After you get your template arranged to your liking, use Backup (above) to save a copy. In my initial experiments, I was surprised to find how easy it was to wreck a template - those little tweaks that you make sometimes can have unanticipated results where you may want to revert to an earlier version. Create a template Backup regularly after making adjustments to your template. I will also note that while sometimes design change is good and necessary, if you substantially change your site frequently, you may confuse and annoy your readers, particularly those suffering from Old Fart Syndrome who may not appreciate searching for content. 2. 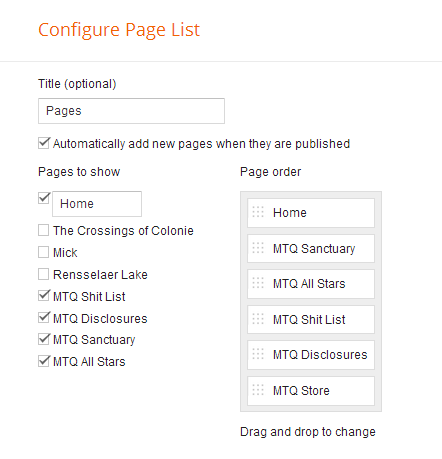 (Pages, then Layout) Using standalone (also referred to as static) pages. Google Blogger currently allows you to have up to 20 standalone pages. Creating these pages is fairly simple and straightforward, just go to the "Pages" section in your Blogger settings and click the "New Page" button. What isn't so apparent is where to set up which pages should or shouldn't show up on your page navigation (assuming that you want some pages to show up on a navigation bar). To do this, you need to go to Layout, then edit the Pages "gadget". After you click the "Edit" link you will get a screen as shown below which is then simple to check the box for "Pages to show". (Note: You can also arrange the order of the pages to show on your navigation bar by clicking, holding, then drag and drop into the order that you want them to appear). While this may seem apparent to some, it may not be apparent to everyone as some gadgets can only be used one time and other gadgets can be used in more than one instance in your Layout. (Blogger will mark one time gadgets as "Already added"). Adding multiple instances of this type of gadget permits you to control and finesse areas of your blog page. The ability to use these gadgets provides a good reason to learn some basic HTML or spruce up on your current skills. You will use these gadgets if you want to paste in code generated from providers such as Amazon or Paypal as appears on MyTurnQuips.com. 4. (Settings > Basic) Check your Publishing settings to make sure you maximize the benefit of your custom URL. I strongly encourage folks who are considering using Blogger to pay the $10 per year and get a custom URL. 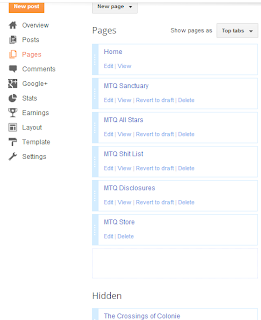 Initially, I could not understand why I was not successful finding my blog by only typing MyTurnQuips.com. (I always had to include the "www"). After a couple of months I found buried after clicking the "Edit" link in Publishing, Blog address is a check box to "Redirect myturnquips.com to www.myturnquips.com". This box needs to be checked to make this happen. (Apparently it is not checked by default; I'm not sure why as I would think most people would want it enabled. You will want to check this box). When starting out, I recommend that you select "No" for "Show word verification". If you select "Yes" you will force users to successfully read and enter what is called captcha. Speaking for myself there are many times when I cannot read the captcha correctly and it just plain frustrates me to the point of giving up. I also recommend showing Backlinks as this provides an incentive for other bloggers to comment in that they are rewarded with a backlink to their blog. 6. (New Posts) Always Insert a Jump after the opening paragraph or opening "hook" of each post. I used to have the full post of the newest posting show on my home page and then would go back and edit and add the "Insert jump break" after a newer post was placed on the home page. I have started to add the "Insert jump break" to every post right from the start. There are 2 reasons: First, I don't have to remember to go back to the older post and edit it to add the jump link. Secondly, and most importantly, is that by including the jump break from the start, a greater variety of posting is exposed above the fold. I believe this increases the chances of attracting a new reader as it is possible that the current post may not be of interest, but perhaps one of the other recent posts may be of interest to a new reader. When the full content of the current post "hogs" the page, it places the previous posts below the fold. (The fold is an imaginary line whereby the reader needs to scroll to see content lower on the page). 7. (Settings > Other) Carefully consider your RSS setting options. RSS feeds are convenient for your readers to have your recent posts sent to their computer or mobile device; however, they may detract from the reader coming to your site. For this reason, I have chosen to set the "Allow Blog Feed" to "Short" (because I have now transitioned to always using jump breaks, the "Until Jump Break" setting is also a viable option). This way readers can subscribe and receive a "nibble" of my content, but ultimately will be lured to my site if they want the full course. I recommend that you make an Export copy of your Blog at regular intervals. This file will be important if you ever need to reconstruct your blog or if you choose to migrate to a different blog provider (such as migrating from Blogger to Word Press). 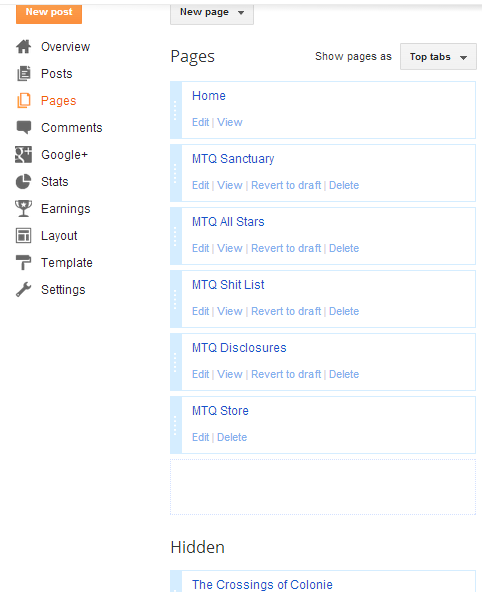 This first year has been a great learning experience and I am hopeful of another terrific year for MTQ with Blogger!